Our team welcomes you to Bingham-Lester Dentistry. We are eager to make sure your visit is comfortable, pleasant, and productive. Lauren is a graduate of the Community College of Baltimore County's Dental Hygiene Program. Going to the dentist was her favorite 'doctor's visit' growing up, which began her interest in pursuing a career in dental hygiene. 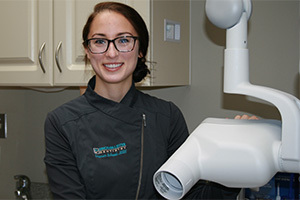 She always thought getting her teeth cleaned was the best feeling and hopes to provide that same experience for her patients. Her calm demeanor helps to make your visit stress free and enjoyable. In her free time, she likes to workout, go to concerts and spend time with friends and family. Michele is a graduate of Allegany College of Maryland and is a Registered Dental Hygienist. Since young childhood, she always knew she wanted to become a dental hygienist. After having the opportunity to work in the dental field as a teenager, she knew this was the career for her. Michelle maintains the same passion for hygiene as when she first began her career over 20 years ago, stating, "Making patients feel at ease and smile again after coming to the dental office is a wonderful sense of accomplishment at the end of each day." During her career, she has had the opportunity to work with doctors practicing in several specialties including periodontics, orthodontics, oral surgery, and pediatrics. Michelle has also shared her expertise in the field by mentoring other dental hygienists. In her spare time, Michelle enjoys traveling to different beaches, working out, scrapbooking, college football (ROLL TIDE), and spending time with family and friends. Ebony is a graduate of the Dental Assisting Training School in Columbia, MD and is cross- trained to work in front office administration. 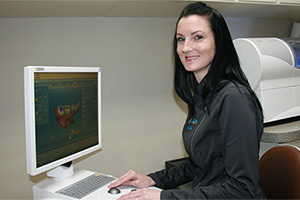 She has been in the dental field for over fifteen years and loves to learn new tasks in dentistry. 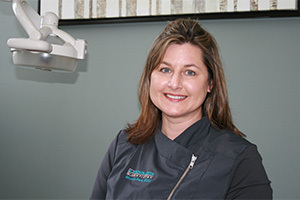 Ebony makes it easy to schedule appointments especially if you have any reservations about dental care. Her knowledge of dental insurance plans and her clinical dental experience combine to make her a huge asset to our team. Ebony is happy to assist you with understanding how your dental plan works. She has a wonderful personality and enjoys making patients feel great about themselves and eager to start treatment. We love working with Ebony and know you will too. While not in the office Ebony loves cooking and spending time with family and friends. 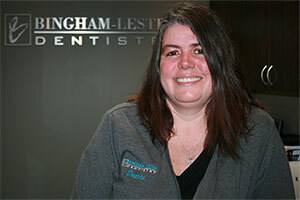 Shawn M "I had a wonderful experience as a first time patient at Bingham-Lester Dentistry. 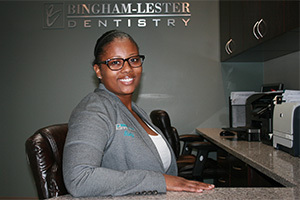 Dr. Bingham-Lester is very cheerful and easy going, which really puts you at ease when visiting the dentist. Making sure I was comfortable at all times was very important to Dr. Bingham-Lester and the hygienist, Michelle. I'm very glad to have found them and look forward to my next visit."